My name is Zahra, and I am 45 years old. I am a mother of six children, the eldest of whom is 18, and the youngest is five years old. 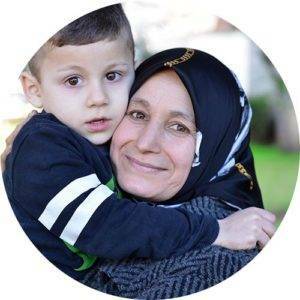 I was living with my husband and children in Syria before the war, but as the war started, my husband died in a traffic accident, and I remained alone with my children. When we came to Turkey, we stayed in a small home with one room and a kitchen, which we also used as a bathroom. The owner of the home provided us with a lot of help. A year and a half ago I moved to live with my family, and one of my sons is working. In addition to this handicraft work of mine, we are receiving support from the Turkish Red Crescent. My children are my hope in life. I would like to thank those responsible for this work because it gives us a chance to earn a living.